Ok, one more post on public sector emplyoment, a quick little follow up to recent posts – plus it includes an interesting and informative graph at the end. Recall this graph from the previous post. 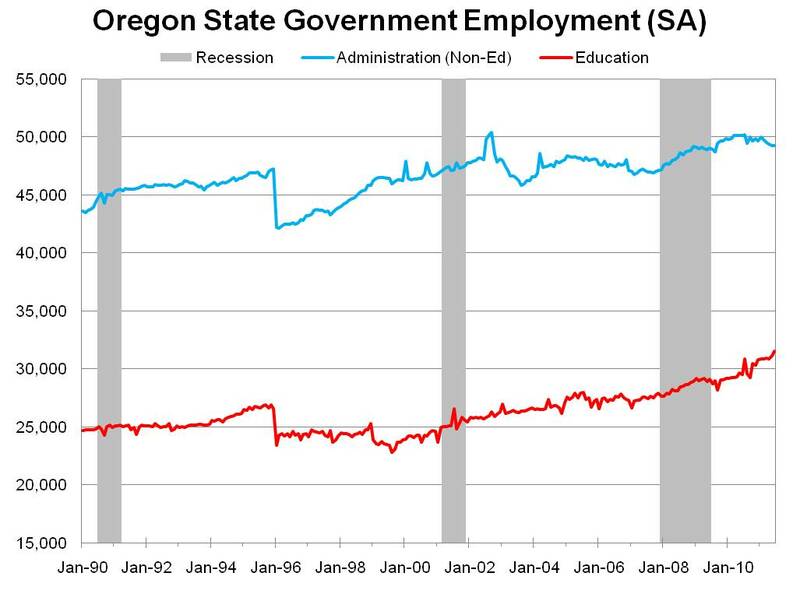 Total state government employment in Oregon has increased since the beginning of the recession, however the primary driver of the growth is state education employment – the Oregon University System. The current growth rate of state education employment is approximately 5 percent year-over-year and this growth rate has been fairly steady for the past 12 months. Since the beginning of the recession, state education has added over 3,500 jobs on a seasonally adjusted basis for a gain of approximately 14 percent. Obviously the recession has had a great impact on labor market prospects for both young and experienced workers and has driven many more individuals to seek higher education. This is the reason state education employment continues to grow significantly. Individuals attend/return to college both to gain additional skills and become more marketable to prospective employers, but also, partially, because the opportunity cost of higher education is lower in recessions as entry-level jobs are not abundant. The graph below plots total enrollment (Fall headcount) in the Oregon University System. 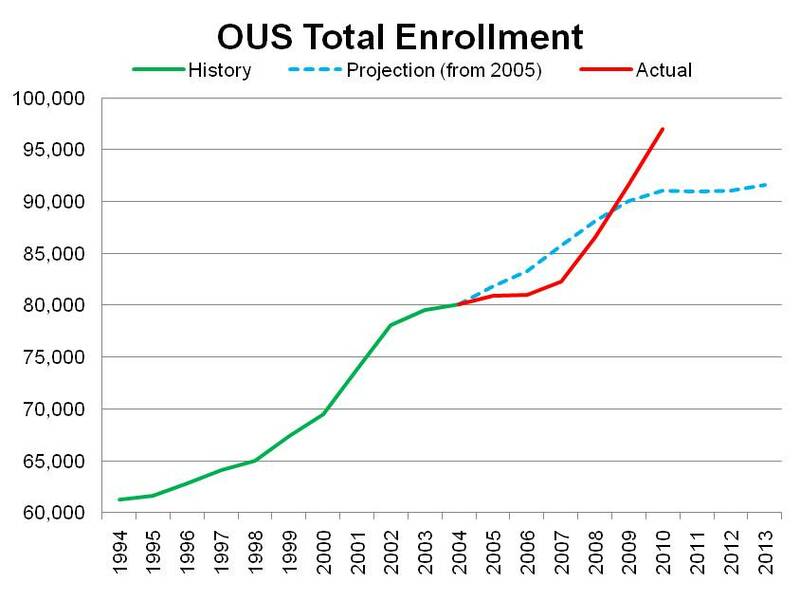 The latest projection I could find quickly on their website was from 2005 and the graph shows historical enrollment through 2004, the OUS forecast for enrollment from 2005-2013 and then the red line is actual enrollment through 2010 (data here). During the expansion period of the mid-2000s, enrollment was less than originally forecasted, partially because there were many more jobs available, which forces the opportunity costs of college up. (On the margin, why would an 18 or 20 year old attend college and take on tens of thousands of dollars in debt when s/he could readily find work in the construction industry building houses for $15-20 per hour?) As employment prospects dwindled (or collapsed outright) the opportunity costs dropped considerably during the recession and higher education enrollment spiked.